I recently rode the Tern Vektron folding ebike but before I could put publish my review, Tern announced that they’ve improved the design. General Manager for North America Steve Boyd took me for an interview/bikeride around the hills of Manhattan Beach California last month with their popular GSD cargo bikes. Again, the bike I rode got a big update so it only got better at Interbike. I’m glad I waited because the updates address some of my very few concerns about the bikes. Before that, let’s back up a bit. Tern really only makes two electric bike models and spends a lot of time sweating the details on each one so it’s important to have a good understanding of what each does and what market it is aimed at. These are not cheap bikes but they are useful. The Tern GSD is such a cool bike idea that it is a head-turner (ha!) even at bike events like this week’s Interbike. It is a cargo ebike that can fit into most cars with its small wheels, folding handlebars and retracting seat post. But, with its Bosch motor and new dual 500wh battery system, it can carry a child or some heavy cargo for long distance travel. Even though it looks longer than a normal bike, it isn’t. All of that space is gained by having smaller wheels and moving the seat post forward. It is rated for 400lbs. That’s so unique Tern even had to get specially made, thick stable 20-inch tires, that look more like moped wheels than folding bike tires. But those tires don’t slow down the GSD at all. In fact, Tern General Manager for North America Steve Boyd and I drove from El Segundo to Manhattan Beach in LA up and down some very steep hills without breaking much of a sweat and getting up to its Class 1 speed of 20mph pedal assisted quite often. If I had the kids on board, I’d probably slow it down a bit but not because the motor didn’t have the power. The ride has only gotten better with the new S00 Model. The Enviolo N380x hub variable speed transmission tested this week was a smooth driver offering 380% gear ratio with infinite gears – a worthy upgrade from the previous model. The New Bosch CX Performance motor is smooth and torquey and quieter than previous models. 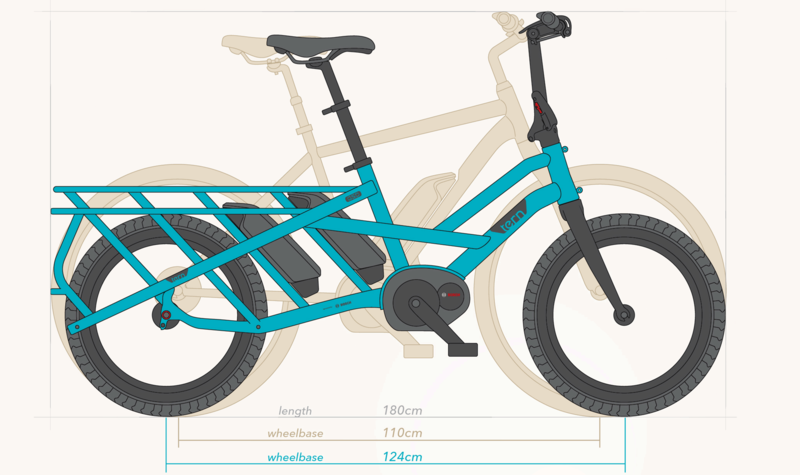 Tern riders can choose either a standard 500Wh (later upgradable) or a new 1000Wh configuration for a staggering range of up to 124 miles (200 km). In fact some of the Bosch folks rode the GSDs from LA to Reno over 4 days. The back still has a bunch of different accessory configurations and there’s even a front mounted cargo holder as the animation above shows. Most interesting is the kid carriers but if you just need to move stuff around, this is great for that, too. Tern is marketed to urban folks but I like the idea of throwing the kids on the back and taking them to school the fun way. The Tern Vektron also got a nice update for this year. The Vektron is a folding bike but one with big strong wheels, structure and rack in the back. For the update, Tern expanded the back rack with what they call “GSDna” meaning that you can store much bigger things on the back including precious cargo (read: kids) using the same GSD accessories. New this year is the Bucketload pannier illustrated in the top image that also folds up nice below. The whole geometry of the bike has changed and it looks like it is halfway morphed into a GSD. In addition to being stronger and lighter, the battery now sits lower making the center of gravity lower and the ride better. It rides like a dream and unlike just about any folding bike I’ve ever tried. It feels incredibly stable even when bombing hills at close to 40 miles per hour. That’s something I wouldn’t even attempt with typical folding bikes. Bosch’s new Active Line drivetrains are substantially quieter, smoother, smaller, lighter, and more efficient – and the improvement in ride is noticeable. The three Vektron models now include the Vektron Q9 at $2995, the Vektron P7i at $3195, and the Vektron S10 at $3595. We got to spend some quality time with the folks at Tern at Interbike 2018 and the team seems like they are very focused on these bikes and continuous improvement on every detail. If you are in the market for folding/cargo ebikes, I don’t think there are better bikes out there.